TC does… a tank? Yes. I have been known to do some. 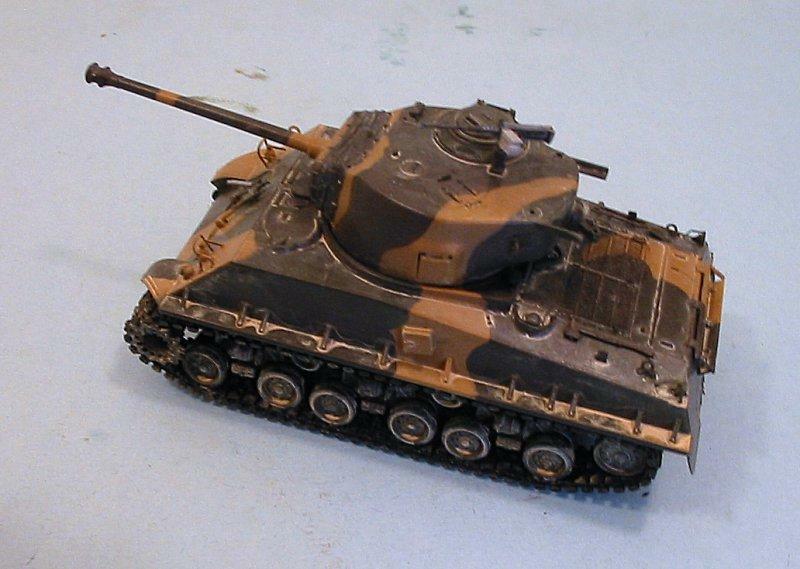 This is the Hobby Boss 1/48 M4A3E8 “Easy Eight”. At the outbreak of the Second World War, U.S. Army doctrine did not support tank vs. tank warfare. Enemy tanks were to be destroyed by anti-tank artillery or by lightly-armored tank destroyers. 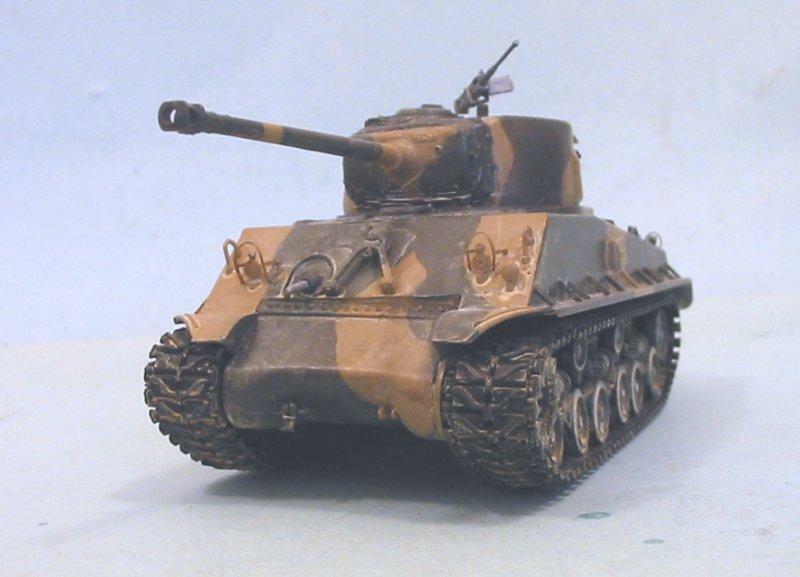 Thus, the M4 Sherman that became the primary American armored fighting vehicle employed during the war was designed as an infantry support vehicle. The 75mm cannon was a low-velocity weapon that was admirably suited to infantry support, and allowed the Sherman to meet the German Pzkw III and mid-production Pzkw IV tanks on an approximately-equal basis in the fighting in North Africa, though the Sherman was outgunned by the Pzkw IV Ausf L and later with the high-velocity 75mm cannon. Before combat was over in North Africa, the Sherman came up against the Pzkw VI Tiger I, which was completely superior and could only be defeated by attack by several Shermans getting in close and firing at the Tiger’s rear. 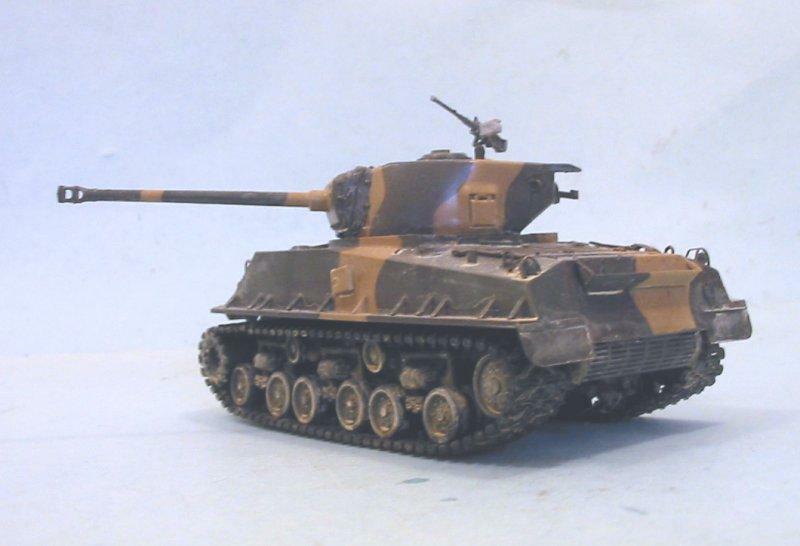 By the time the North African campaign was finished, U.S. Army tankers had a well-developed fear of the Tiger. Despite the entreaties of armored warfare veterans to design and introduce into combat a tank that could meet the Tiger and the new Panther tanks on an equal basis, the Army Ground Forces refused to do so, stating their belief that the Panther and Tiger tanks would never be met in large numbers on the western front due to their commitment on the Eastern Front. 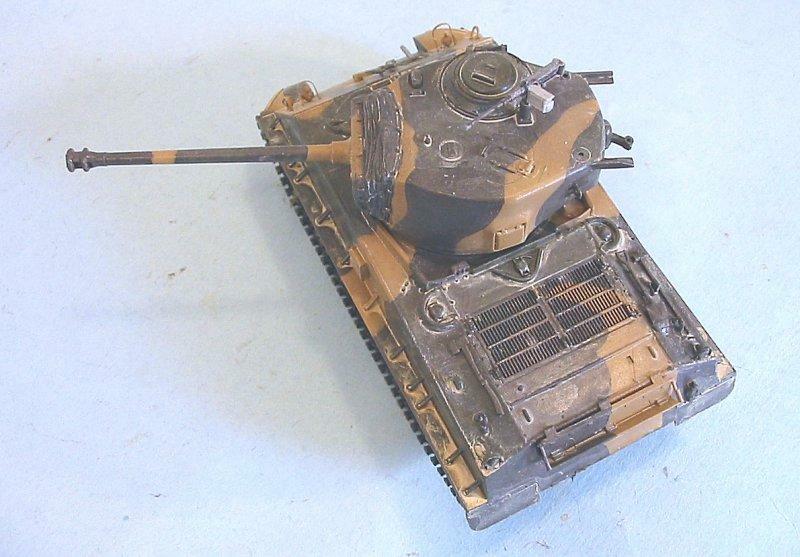 While Army Ordnance began design and development work on the Medium Tank T20 as a Sherman replacement, the Army decided to minimize production disruption by incorporating improved parts of other tank designs into Sherman production. Late production M4A1, M4A2, and M4A3 Shermans were upgunned with the larger T23 turret firing a high-velocity 76 mm gun M1, which improved anti-tank performance. Following D-Day, Tigers remained rare but Panthers were half of all German tanks on the Western Front, and were clearly superior to the standard Sherman. Shermans armed with the 76mm weapon were sent to Normandy in July 1944. The higher-velocity 76mm gun M1 gun gave Sherman anti-tank firepower comparable to the Soviet T-34/85. The M4A1 76 (W) was the first upgunned Sherman to enter combat, closely followed by the M4A3 76 (W). By the end of the war, half the American Shermans in Europe carried the 76mm gun for anti-armor work. The most important major improvement in the Sherman involved the complete redesign of the suspension. Combat experience demonstrated the short life of the original vertical volute spring suspension system originally designed for the M3, due to the Sherman’s increasing weight from the bigger guns and bigger turrets. While the Sherman had good speed both on and off-road for the era, off-road performance varied. 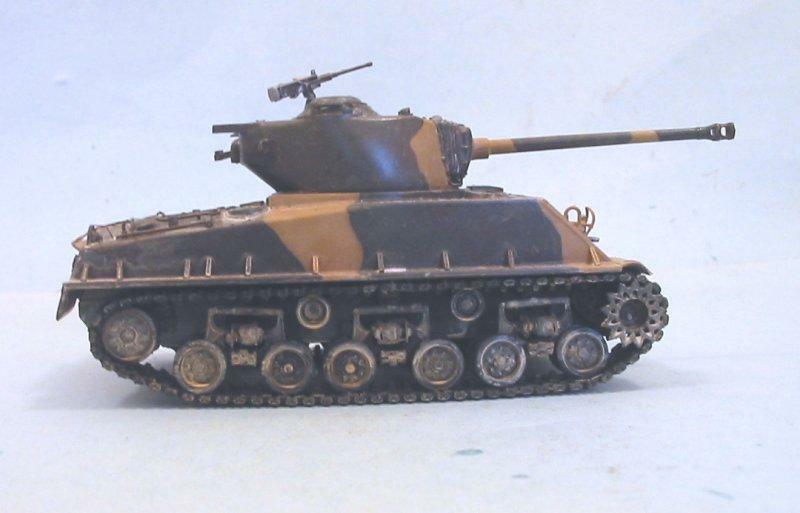 In the North African desert, the Sherman’s rubber tracks performed well, and in the confined, hilly terrain of Italy, the Sherman could traverse terrain German tanks could not. However, on soft ground such as mud or snow, the narrow tracks provided poor floatation as compared to wide-track German tanks like the Panther. 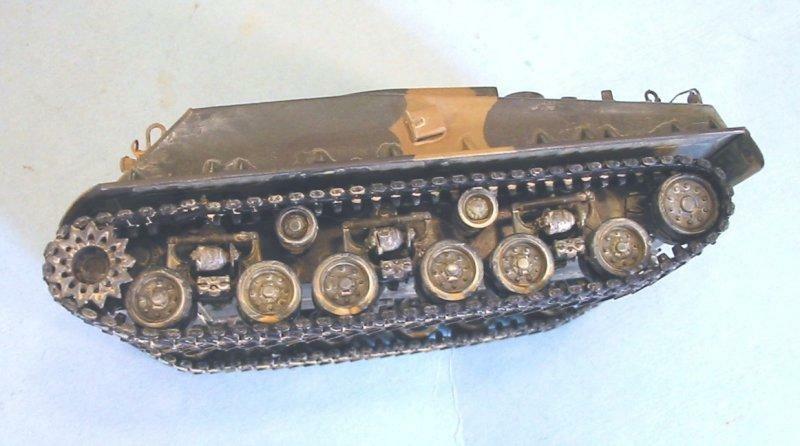 The Army issued extended end connectors known as “duckbills” to add width to the standard tracks as a stopgap solution; these were original factory equipment for the heavy M4A3E2 Jumbo, to compensate for the extra armor weight. In response to all this a new suspension was developed, known as the Horizontal Volute Spring Suspension, or HVSS. Its main advantage was that when the horizontal volute springs were placed in compression by either the front or rear bogie wheel arm, the load was transmitted to the opposite arm, keeping tension on the track. The HVSS suspension increased the M4’s weight by 2,950 pounds with the T66 track or 4,780 pounds with the heavier T80 track. 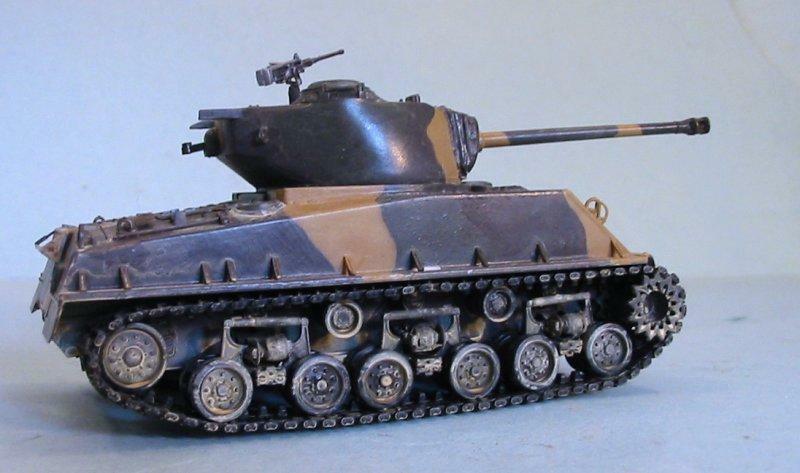 The experimental design was identified as E8, which led to M4 tanks equipped with the HVSS being nicknamed “Easy Eight”. The main armament was a 76mm cannon capable of firing an AP round at 780 mt/sec, and able to pierce 101 mm of armor at 1,000 yds. Finally, there was a Sherman that could penetrate the front armor of the Panther, though it had to be done at close range. 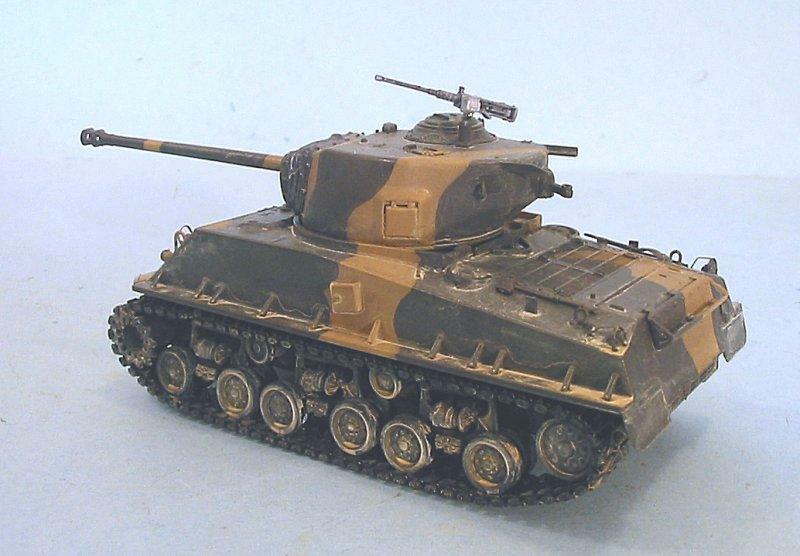 The M4A3E8 entered production in March 1944 and it remained in production through April 1945. 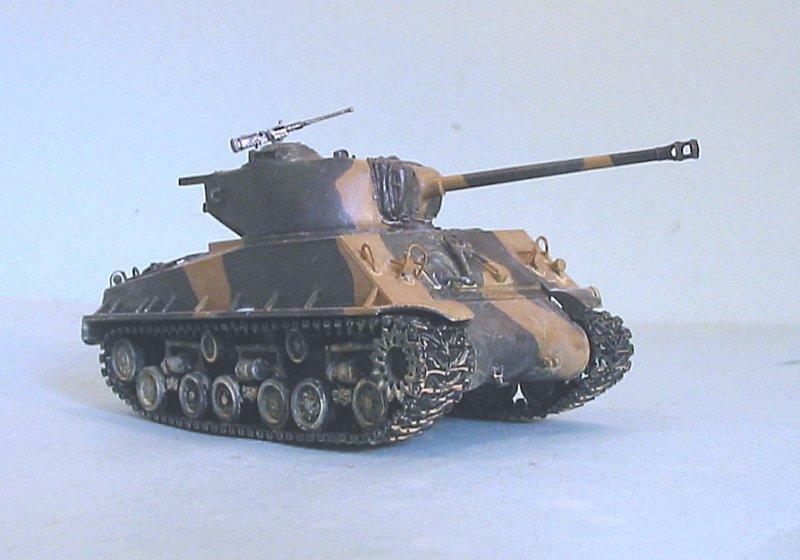 Called the “Super Sherman,” the M4A3E8 became the standard tank of the 3rd and 7th US Armies in Europe. Although it could not compete one-on-one with either the Panther or the Tiger, its technical reliability and powerful armament, coupled with the US Army’s logistic organization, guaranteed the M4A3E8 a prolonged life. After being made famous by such armor commanders as Creighton Abrams, the tank fought in Korea as well as in the Middle East with the Israeli Army, as well as many American allies in the post-war years. 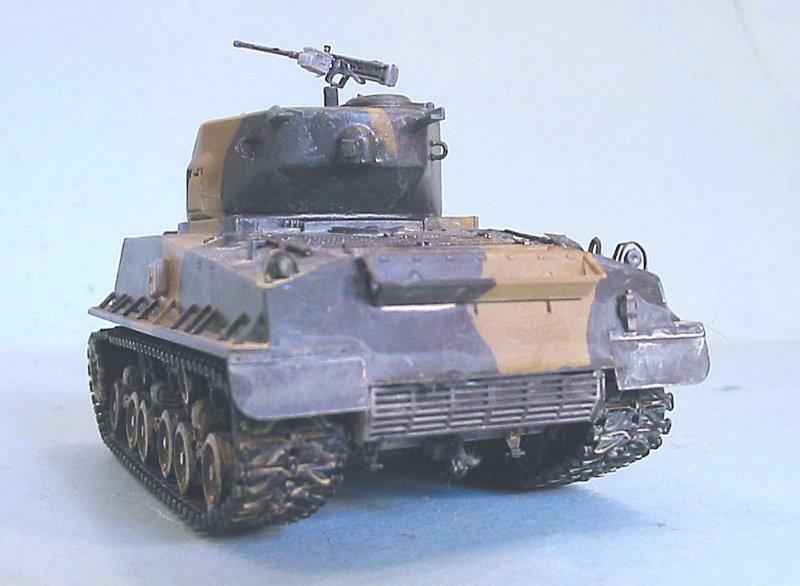 The M4A3E8 kit consists of 232 parts in light grey plastic, a small etched fret with 14 parts and a set of vinyl tracks plus the decal and instruction sheets. 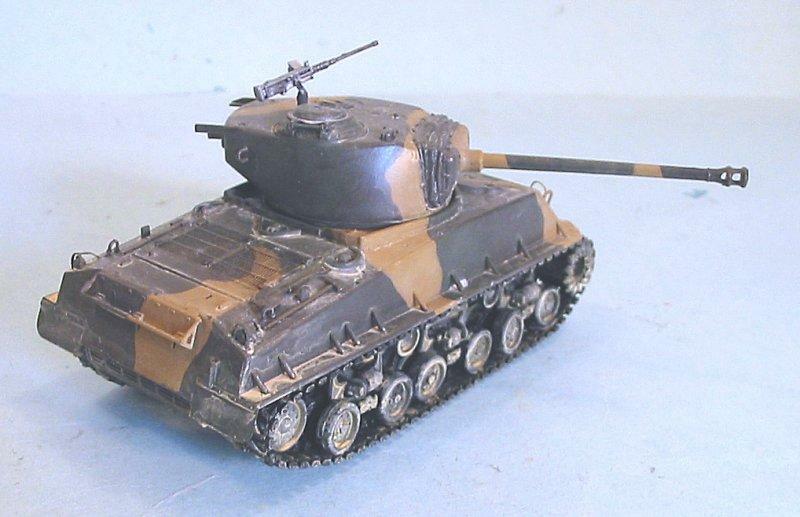 Of the four Sherman kits released by Hobby Boss, this is the only one that is even close to accurate in dimensions and outline. 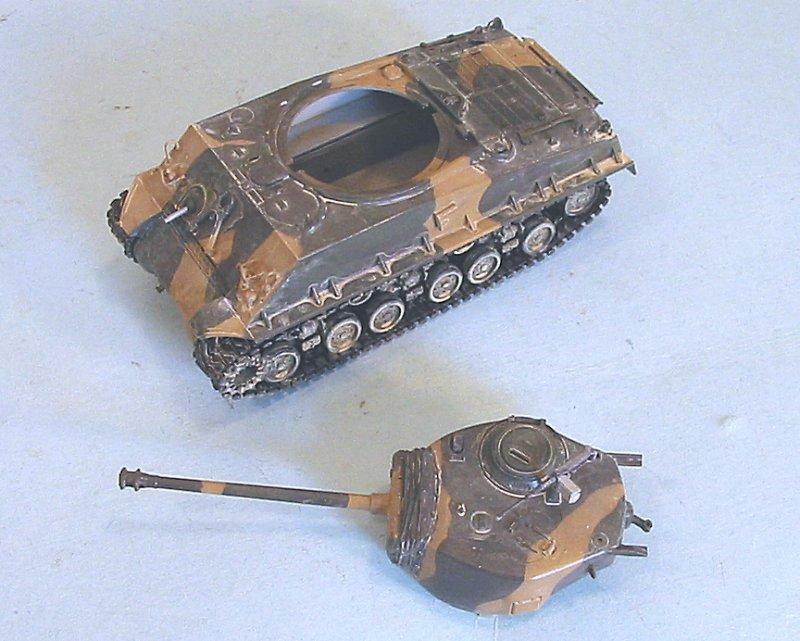 Other reviewers have complained that, with the number of restored Shermans available for research, it is incredibly frustrating that these new kits would be so wildly inaccurate. The detail level is good, with well defined detail relief and very delicate separate parts such as the barrel travel lock, lifting eyes, the tools and bogie detail. Unfortunately, fit of some parts compromises the detail, and there is more flash on parts than one is used to with the Tamiya line of 1/48 armor. While other reviewers have not been so happy with the diecast lower hulls of the Tamiya kits, they provide heft to a small kit, and that heft is noticeably lacking with this kit, in which all parts are injection plastic. Dimensionally this kit measures out accurately for such items as hull length, turret height and diameter, the bogies and most of the smaller components. 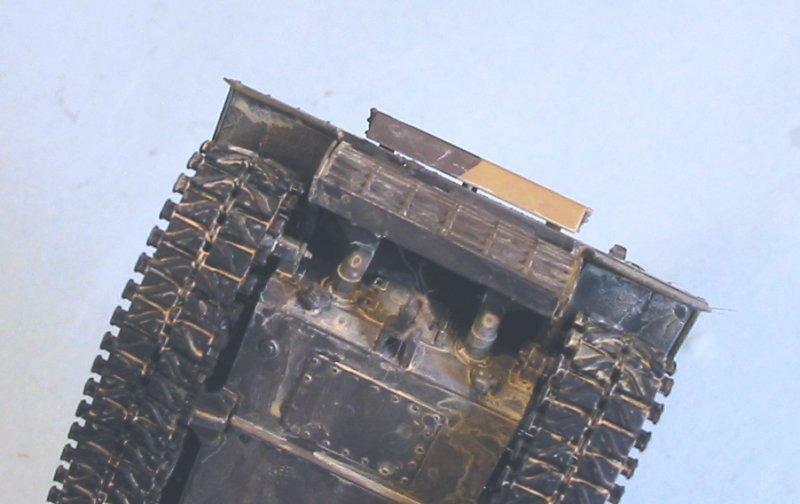 On the M4A3E8, the hull width, length and 47E glacis angle are correct. The side fender extensions are a bit too wide but it is really not all that noticeable. The grill and other details on the engine deck are nice and there are two alternate engine decks, one the standard deck and the other with added brackets down the sides. Both decks fit the hull well. The tools are separate with nice details. The kit provides a small sprue with twenty rucksacks which have good detail as well as a selection of jerry cans and a few wood boxes and small metal drums to add as stowage. I elected not to use them on this kit, but have dropped them in the spares box for use on my other Tamiya Shermans. 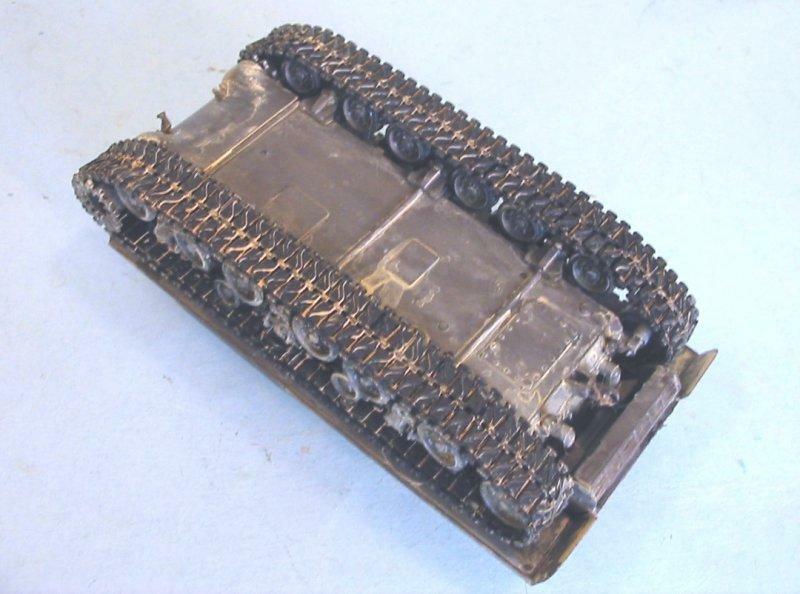 Personally, I didn’t like one-piece rubber treads 50 years ago with the old Aurora 1/48 armor, and my dislike is even more nowadays as I have become used to using the segmented plastic track provided in the Tamiya kits. The good thing about these is that the tracks that come in the box are the T80E1 steel chevron type, which are appropriate for Korean War Shermans. I wasn’t able to use my standard method of assembling the turret, the upper hull, and the lower hull and tracks as three separate sub-assemblies since it doesn’t really work with this kit. 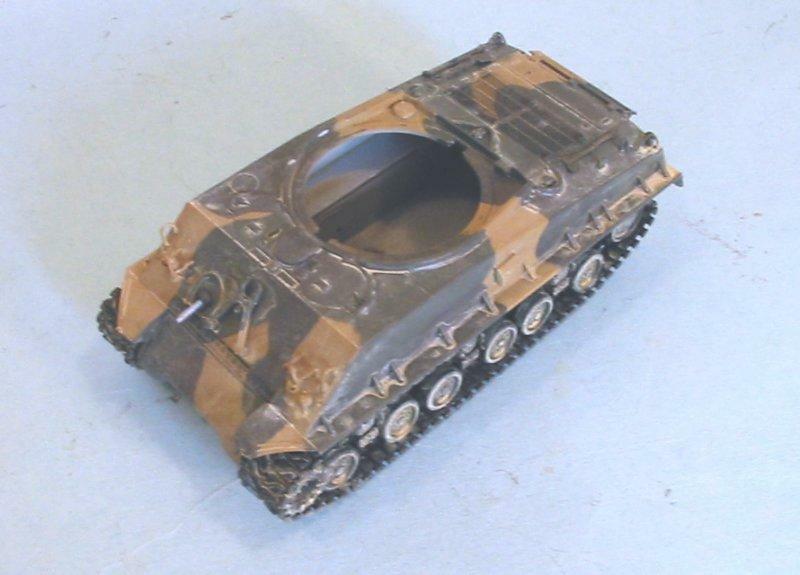 I ended up assembling the upper and lower hull as one assembly, with the turret as a separate assembly, and the tracks attached later after painting the model. The hull side final drive housings will sit at the wrong angle if you follow the instructions, but it is simply a matter of cutting off the locating pin to enable the part to fit at the correct angle. Assembly of the bogies is straightforward with very good fit of the bogie parts although the HVSS assembly is weak and broke several times during assembly of the different sections. Fitting the upper and lower hulls was troublesome since there is a large gap at the front between the upper hull and the transmission housing bolted flange. I added plastic sheet behind the bolted flange to support the upper hull and hold the upper hull correctly. The turret is mostly OK, though the gun cannot traverse vertically since the mantle has the canvas cover, which is injected plastic. .50 cal and .30 cal machine guns are provided but they are chunky especially the perforated cooling jackets but these are difficult to depict convincingly in this smaller scale. Researching the model, I found a color photograph of an M4A3E8 in Korea with a field-applied three-tone camouflage of the basic olive drab, dark green and tan. 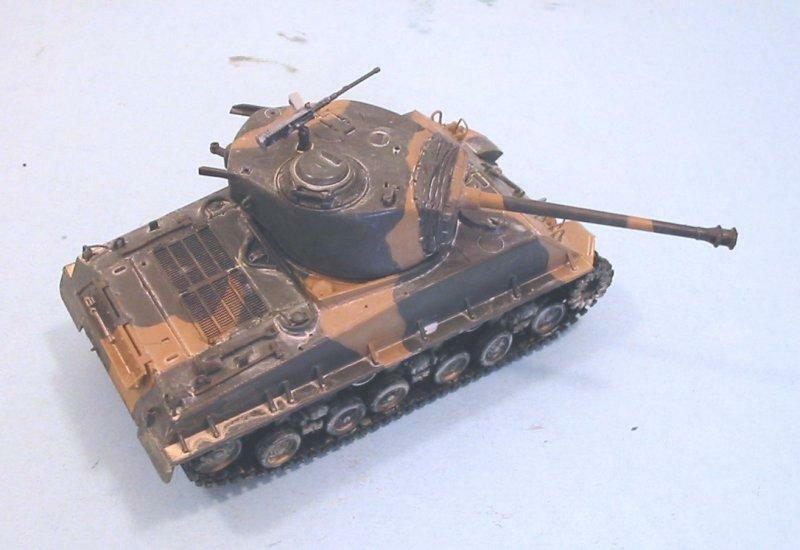 I wasn’t interested in doing the “dragon” markings the kit provided, so I went with this to make a model that looked different from my other Shermans. I used Tamiya Olive Drab, Khaki and Desert Yellow for the colors. 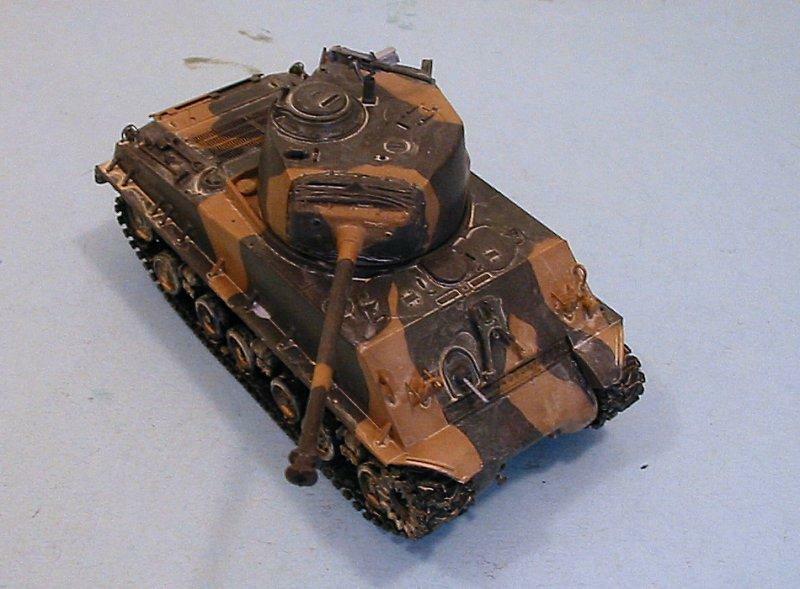 I weathered the model with the Tamiya “makeup kit.” In Korea, you can go from a frog-drenching rain to a near-desert in the same patch of countryside in a matter of hours, so I did this as a tank that had recently been rained on, stirring up all the mud and dust before letting it dry out rapidly. The Hobby Boss M4A3E8 is a mixed bag that combines sharp, good-looking molding with some unfortunate accuracy problems. 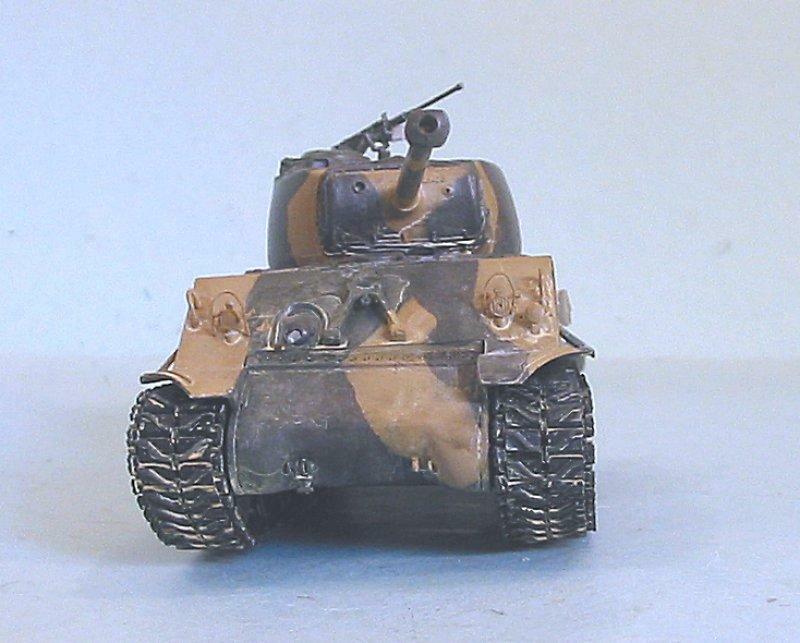 It’s funny that the Sherman kits are as bad as they are, since both the T-34/76 and T-34/85 kits are among the best and most highly-detailed 1/48 armor kits I have ever seen. 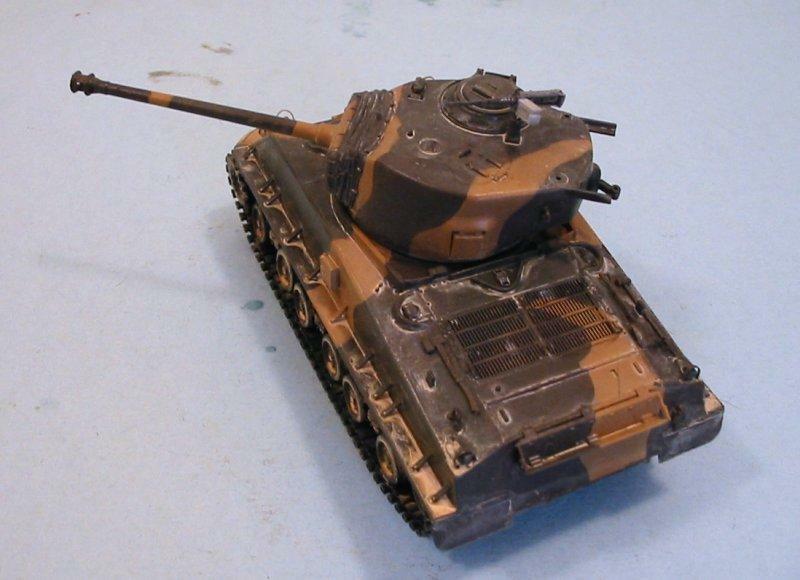 The only one of the Shermans I can recommend is this one. Ah, you’re just jumping on the “Fury” bandwagon aint ya. Seen it yet? I haven’t maybe this weekend. “Light ’em up!” in 1945? Hmmmmmm……. Looks great Tom and thanks for the background on the E8. You should see Fury and see what you think. There is a four Shermans vs. one Tiger scene that you can judge how accurate you think it is. An awesome Easy 8 Tom. Nice bit of history behind this tank supported by good photos. Well done as usual Tom. Two thumbs up from me!!! I did a double take when I saw your name against armour…. I did the Easy Eight in a version brought out by Tasca a couple of years ago and it was one of the nicest kits of any kind I’ve ever worked on. Yours certainly has that typical ‘in yer face’ Sherman look, and the road wheels have the right look for wear. Maybe a little engine exhaust around the grille faces would be the cherry-on-the-cake for me, but a nice looking build in any case. You should do more of them! great build Tom, it has a nice weathered look to it. I’m working on my first tank at the minute. They are good fun actually!